As the second stage of the RE_Lab program that is organized with the collaboration of 2017 Tandem Turkey shareholders, TAK Kadıköy, and the Madrid-base art collective, Hablar el Arte, Bihter Çelik and Dilara Kara from –trak and Architecture for All (HiM) participated in Arquitectos Collectivas X (10th Meeting of Collective Architects) in Canary Islands from the 13th to the 24th of July 2017 at the invitation of Todo Por La Praxis. Arquitectos Collectivas is a project in which more than 60 architecture collectives come together annually to share their skills and techniques while having a positive impact on the ground. Each year, a different collective undertakes the fieldwork and the organization of the project that takes place in different countries. 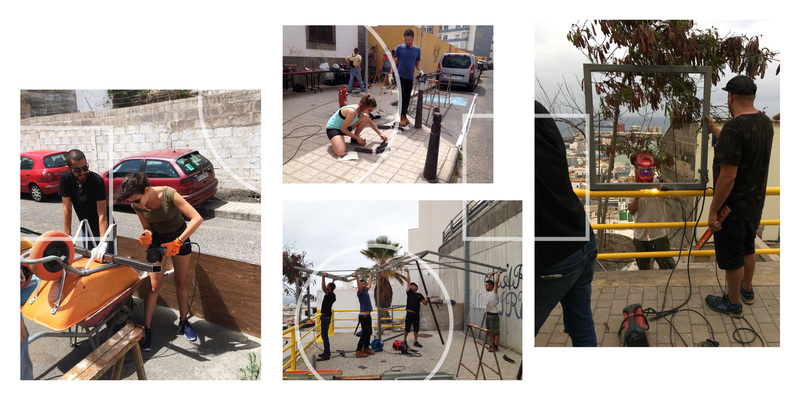 This year, Colectivo Micro Macro organized the project in Gran Canaria Island aiming the rehabilitation of a neighborhood called El Risco. With the help of the yearlong fieldwork conducted by Colectivo Micro Macro and the visits made in the neighborhood, the participants focused on the potentials of the abandoned areas. Three projects having a participatory framework were conducted with the help of residents and volunteers who joined the collectives in the process of design and construction: (1) a project in which an abandoned ground area was transformed into a gardening space following its landscape design, (2) a large-scale mural art project aiming to demonstrate the problems of the neighborhood, (3) a project designing the playfield. During the process of design and construction, all suitable spaces in the neighborhood were utilized as workshops, offices or storage areas. At every stage, the decisions regarding designs were made through deliberation with residents and by asking them questions like the following: Do you need a sitting space? Is that a problem for you if children spend time here? Can you water the plants if we vegetate the area? We constantly updated the design process and the project documentation (technical drawing, digital modelling etc.) during the construction. Rectangular hollow section pipes and a limited amount of wooden material were used in the construction phase of the project during which participants were informed about the techniques of metal-wood cutting, grinding and welding. Stairs facilitating the access to the project area were repaired and painted. Apart from the participants coming from the collectives, some residents in the area volunteered for the project, as well. Alongside with the design projects and applications, which were conducted by Arquitectos Collectivas X, approximately 60 collectives made presentations regarding their own projects.